In addition to Seager, Kenta Maeda (Rookie of the Year) and Dave Roberts (Manager Of The Year) are among the finalists for the awards. The winners will be announced next week. 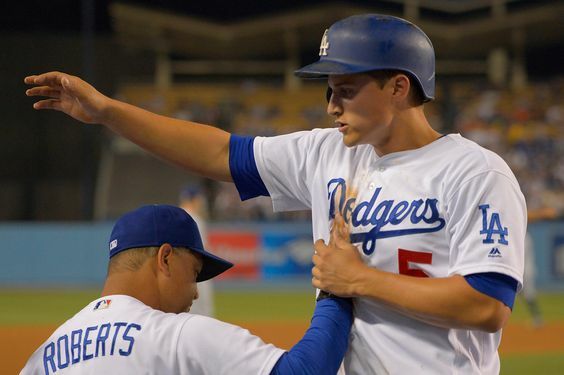 Seager, 22, is a lock to become the Dodgers’ first Rookie of The Year since Todd Hollandsworth in 1996. He led the Dodgers in batting average (.308), on-base percentage (.365), slugging percentage (.512), runs (105), hits (193), doubles (40), triples (5), total bases (321), multi-hit games (57), strikeouts (133) and games played (157). Seager also finished among the top five National League hitters in hits, runs, total bases, and multi-hit games. The only other rookies to win both awards were both in the American League: Ichiro Suzuki in 2001 and Fred Lynn in 1975. Kris Bryant of the Chicago Cubs and Daniel Murphy of the Washington Nationals are the other MVP award finalists. Maeda went 16-11 with a 3.48 earned-run average in his first MLB season following eight as a professional in Japan. The right-hander led the Dodgers with 32 starts and earned nearly $9 million in performance bonuses. Trea Turner of the Washington Nationals is the third Rookie of the Year finalist. Roberts joined Tommy Lasorda (1977) as the only rookie managers ever to lead the Los Angeles Dodgers to a division title, finishing with a 91-71 regular season record. Roberts’ bold bullpen strategy in Game 5 of the National League Division Series — more than a week after the final BBWAA votes were cast — helped the Dodgers clinch a win over the Washington Nationals. Dusty Baker (Washington) and Joe Maddon (Chicago) are the other finalists for the Manager of the Year award. Dodgers left-hander Clayton Kershaw was the National League’s best pitcher when healthy, going 12-4 with a 1.69 earned-run average in 21 starts, but will finish no higher than fourth in the Cy Young Award voting for the first time since 2010. He missed two months with a back injury, which caused him to fall 13 innings short of the minimum required to qualify for an ERA title. Personal disclosure: I had votes in the Manager Of The Year and Cy Young categories. This entry was posted in Awards Season, Breaking news, JP on the Dodgers and tagged Clayton Kershaw, Corey Seager, Dave Roberts, Kenta Maeda by J.P. Hoornstra. Bookmark the permalink.